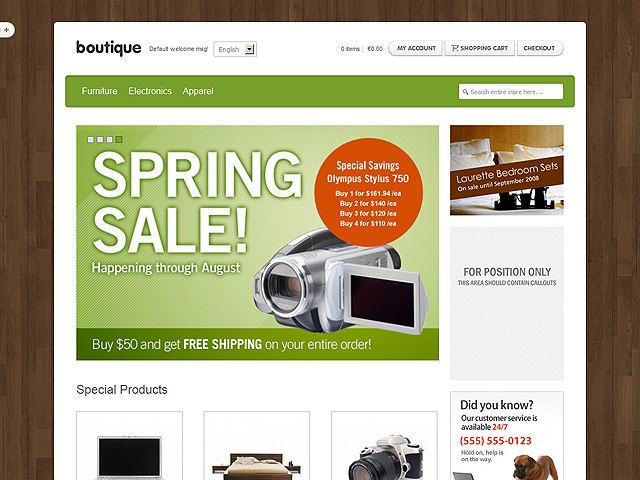 To start with Boutique magento theme offers an extremely elegant design, which feels like your customers are walking through the rows and shelves of goods in your unique boutique at the corner of, say, Oxford Street. The template is very adaptable to all of the ideas that you have in your mind and could recreate them easily in the Internet world. 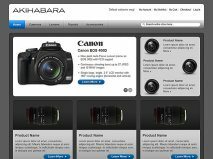 Moreover the exceptionally trendy photo gallery represents numerous photographs of your products, which are of highest quality and it really shows. 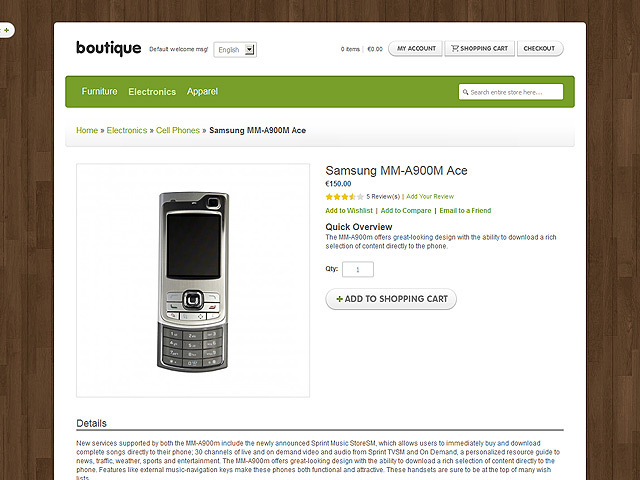 Furthermore the goods pages have a free Lightbox gallery integration, which shows large images of your products, goods, services or whatever stuff you’ve got on offer. What’s more Boutique template is highly customizable, which means that you could change colours, textures and images as a whole. 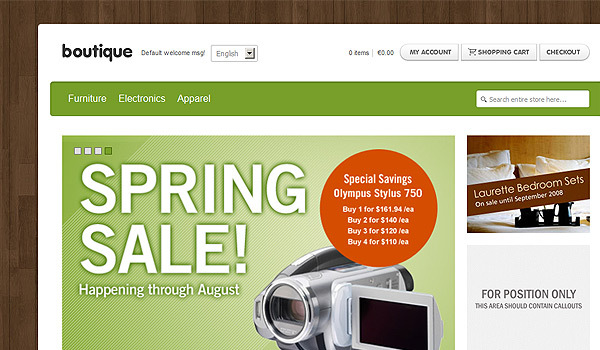 Additionally, the template possesses all the pages that one can need when creating an online store; they range from a homepage with a large photo gallery for presenting the best photos of your products, a category landing page, which is, in fact, a thorough list of all your products and services, a product page with the above-mentioned free Lightbox gallery integration, register or sign in page that empowers you to create your online shopping account, My account pages – your customers actually use their accounts in this particular zone, a Shopping cart page for storing all the details about the goods or services a client is about to purchase, a Checkout page that is the cashier point of your online store, a Content page theme and a detailed documentation one. 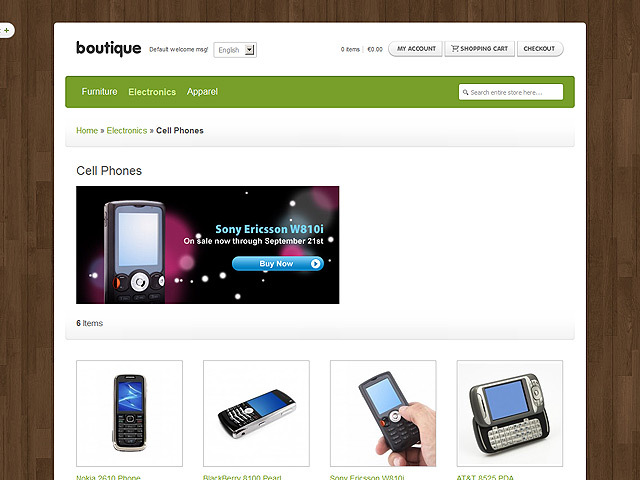 To sum up Boutique is your trendy theme for creating the best place in the net for finding unique goods or services that are especially created for your clients – remember Botique is the boutique shop among all online shop templates.